Ananka's Diary: Which Cake is More Terrifying? bahaha. i can see it now. "Grandma, are you okay?" "Yes dearrrriiiiiiiieeeeeeeee (fakey smile)" "Mommy i'm frightened!" Whoa... It's close, but #2 wins. Skulls you can sink your teeth into. And a purty cake to give to your stalkee. If either of these cakes wound up at your doorstep, would you eat it? Wow... Thats a tough one, I'm going to say.... Number 2! Although #1 is a skull, it looks kind of tastier (Its chocolate!! ), and #2 is just wierd. It's all flowery and pretty, but I can totaly imagine a twisted aunt who still hates you for letting your dog dig up her Mums, seeking revenge. "Okay, lets bake a cake!" lol number 2 because no one will notice it at first and then they will get a shock! hahahahahaaaaaa!!!!!!!!!!!! can i get cake 2 in green and black, for my bday??!?!?!!?!!!? oh, and cake 1 for my cousin. her bday is halloween!!!!! The #1 earns points for decorative-ness and coolness, but #2 is just plain creeeeepy!! 42: I probably would eat them, if only to faze anyone trying to intimidate me. mwahaha...(although eating the first one might disturb me a bit.) Kind of like the African (??) tradition of eating your enemies' hearts/brains. Mmmmmmm.... The cake No. 2 could be used as a psychological weapon. Cake No. 1 is tasty looking. #1 gets points for sheer creativity but #2 seems like the one to be in a bad horror movie. ooooh thumb biter u like making fiends?!?!?!!?! haha love that show! but for some reason it wouldnt download on iTunes :( . but aaannnnnyyyywwwaayyss.... have you ever gotten a book from a parent or relative and they say it looks good but you say blah and then a year and a half late ryou read it and its sooooooooooopr doooooooopr good and it gets a higher ranking in your book kingdom? that just happened to me with the book the wright 3 and i was reading the empresss tomb but i read a kiki strike book about once a month and i lent the first one to my cousin and havent gotten it back yet.................. wow that was a random comment!!! creepy, personally i think the skull cake is amazing. one time my young women leader made a cake in the shape of a purse, it was crazy insane, and delicious. she used like 6 cakes to make it!!!!! i luv both! Ican't chose!!!!!!! I showed my mom and she freaked out and said,"Who cut who's head open?!?!" you know that picture of a 'normal family'? a friend of mine noticed another peculiar thing about the picture. the lady sitting on the heads leg is missing. she crossed them, but the leg on the bottom is missing. kirsten, DO you live in a brownstone? do you want a betta fish? i do. I would love to be given the second one on my birthday. It's next weekend! Hmmm... I could just imagine the look on someone's face when they receive a cake like that. I agree, the skull is pretty sweet, but the freaky threat thrown in amongst the floral, sweet, grandmotherliness is hilarious. 42: Yes. Its still cake. 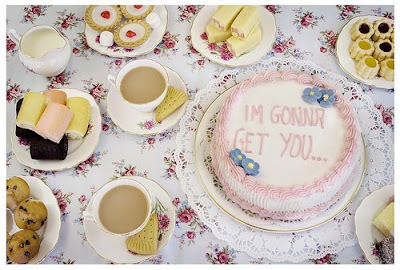 The combination of pink-and-white icing, flowers, and a creepy message beats the scariness of a skull. But the missing apostrophe in "I'M" (it said "IM" instead) is even more upsetting. My inner Lynne Truss is crying. I would say cake one, except for the fact that cake 2 is floral. For some reason, the opposite messages creep me out. Yeah 2 is the winner! I CAN NOT wait till HALLOWEEN! speaking of awsome costumes, nothing is awsomer than a costume that you designed your self. therefor, my costumeis utter awsomeness. ok, i LOVE LOVE LOVE CAKE NO.1, but i think that cake no.2 was a little more creepier cuz it wuz so random like me!! Sorry, I just saw Poltergeist for the first time. I am sorry for my last comment. It was insane and uncalled for. But it was also perfectly understandable because I had just downed a whole can of Pepsi and three mini snickers and a mini Hershey's. In other words I was sugar hyped and apologize for creeping anybody out. Also I had just seen Poltergeist for the first time. Yes, I'm 12 and JUST saw Poltergeist. Big deal. What's a 'brownstone?' besides the obvious answer i mean. 42; YES!!!!!!! Wait no! Yes! No! Yesno! Yes, definitely yes. Oh, wait no. Yes! no. yes.no.yes.no I don't know! The pressure! The Pressure! I think #2 definitely wins!! I would never eat that cake! 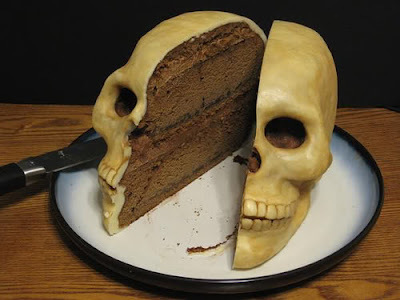 On the other hand, that skull cake is awesome, but not as creepy. I am now in the mood for chocolate cake!